Catholic News World : Wow Google Doodle Honors Catholic Priest who Advanced Sign-Language and Established 1st School for the Deaf - SHARE this #GoogleDoodle True Story! Wow Google Doodle Honors Catholic Priest who Advanced Sign-Language and Established 1st School for the Deaf - SHARE this #GoogleDoodle True Story! 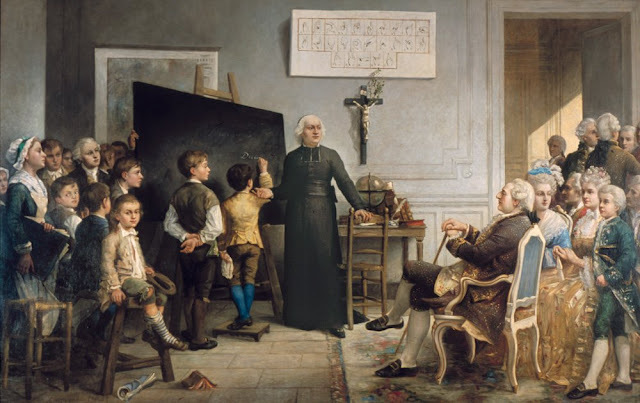 Abbé Charles-Michel de l'Épée was the founder of the first public school for the deaf. He was honored on November 24, 2018 by Google Doodle. Charles-Michel was born on November 24, 1712 in Versailles, France. He died on the 23rd of December, 1789 at the age of 77, in Paris, France. He has become known as the "Father of the Deaf". He studied to be a Catholic priest and was ordained. Then met two young deaf sisters who communicated using a sign language. L'Épée decided to dedicate himself to the education and salvation of the deaf. In 1760, he founded a school the 1st public school for the deaf. The Abbé de l'Épée believed that the deaf should be able to receive the sacraments. He then developed a system of instruction of the French language and religion. He greatly developed the form of sign-language that was in use at the time. His tomb is in the Church of Saint Roch in Paris. Two years after his death, the National Assembly declared that deaf people had rights according to the Declaration of the Rights of Man and of the Citizen. In 1791, the Institution Nationale des Sourds-Muets à Paris, which L'Épée had founded, began to receive government funding. It was later renamed Institut National de Jeunes Sourds de Paris. His methods of education have spread around the world. SHARE this Amazing True Story of a Catholic Priest who Changed the Lives of so Many!